Me, holding a poster we had made for the event. A few weeks before I arrived in Nepal in December of 2015, I confess that doubt weighed heavily on my mind. I’m an international affairs student at Northeastern University in Boston, and much of my degree has been spent learning about international development. Despite my decision to volunteer, I’d heard countless examples of irresponsible or exploitative development practices and feared that those practices, or worse, awaited me in Takure. "I was relieved and grateful to find an organization as responsible, caring and hard-working as Conscious Impact proved to be." Sale day, with my Nepali friend Raj manning the booth! The ten days I spent with the Conscious Impact team tore those fears from my mind, root and stem.... I was relieved and grateful to find an organization as responsible, caring and hard-working as Conscious Impact proved to be. Upon my return to Boston in the fall of 2016 after a semester studying in London, I decided that I wanted to raise funds for this cause and organization that to this day remains so close to my heart. 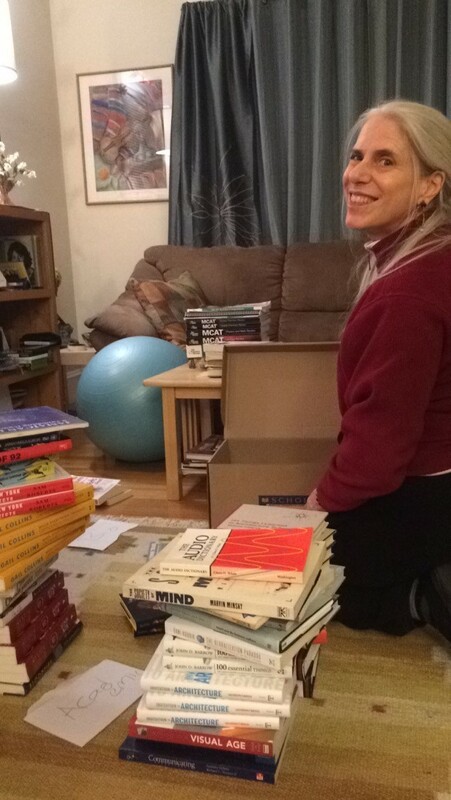 My Momma, helping to sort and organize books! During my time in London, I attended a $1 used book fundraiser hosted by Amnesty International. I decided to bring the idea back to Boston and host my own series of book sales within the Northeastern community, on behalf of Conscious Impact. This approach heartily appealed to me because it creates value for both the giver and the receiver, donors get wonderful new reading material, and the people of Takure get the funds they need to rebuild. Conscious Impact’s official Sales Associates! I sent emails to bookstores, libraries, professors, family and friends, soliciting book donations from as many sources as I could imagine; I parted with much of my own personal library. At one point, over 800 books sat in my Mom’s living room; you can imagine how appreciative she was of the clutter! I used my connections with two groups on campus, the Program on Human Rights and the Global Economy (PHRGE) and the NU Buddhist Group, to have the sales officially sanctioned by the university and, in October, I held my first sale. With friends and family staffing the tables, and speakers blaring our favorite music, the “Books for Bricks” vibe was more ‘party’ than ‘bookstore’! Northeastern’s mascot Paws striking a pose! The fundraiser cost me no more than time, and the gas I used driving my mom’s little red Chevy to transport boxes, first from the donors to my home, and then from my home to the sale sites. Each book cost only $1, but customers were, of course, encouraged to donate extra if the urge struck them. Often enough, they generously left me their change, or an extra dollar or two. All in all, the sales raised $1573.87. I have to take a moment to thank all those who helped: my fantastic friends, my many book donors, and my incomparable mother. Their assistance made all the difference.